Category Archives: You Put That Ad Where? 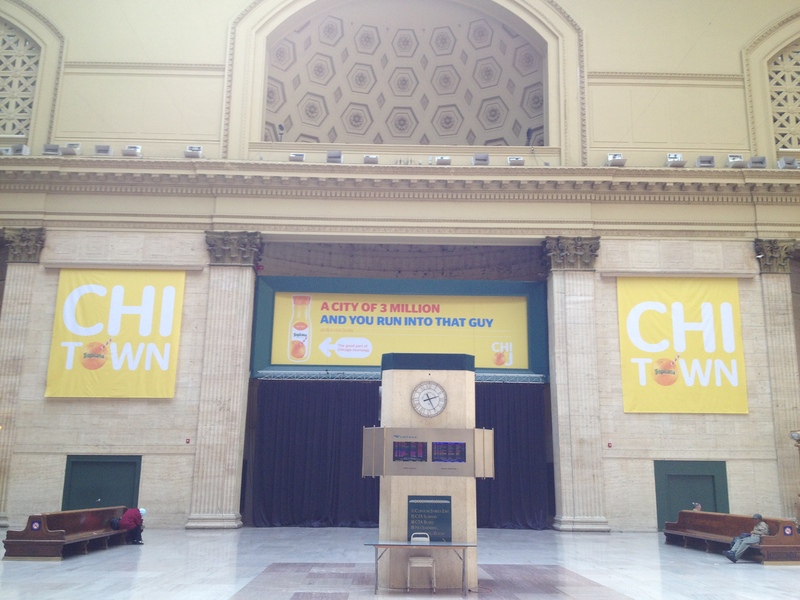 Chicago Train Stations Flooded by Orange Juice. 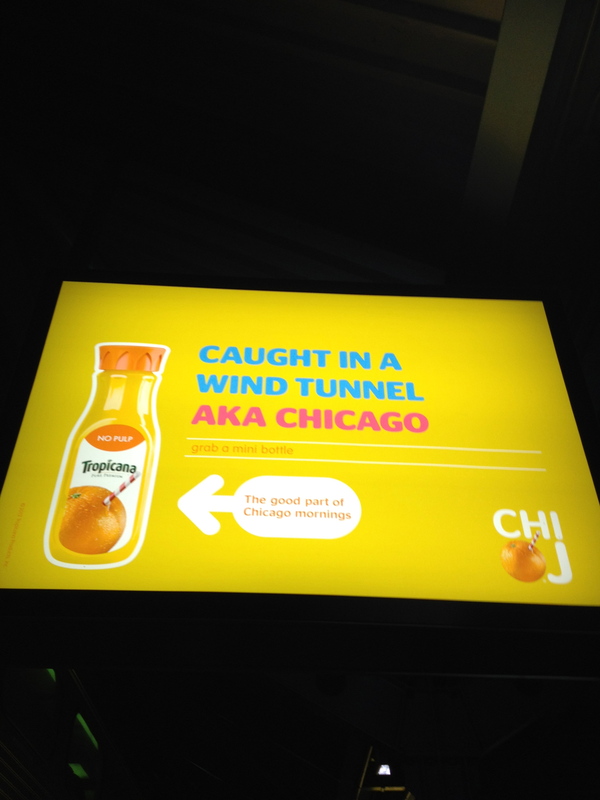 If you’re walking around Ogilvie Train Station and Union Station recently, you’ve seen these ads from Tropicana draped literally all over the station. There are the hanging banners. The overhead billboards. 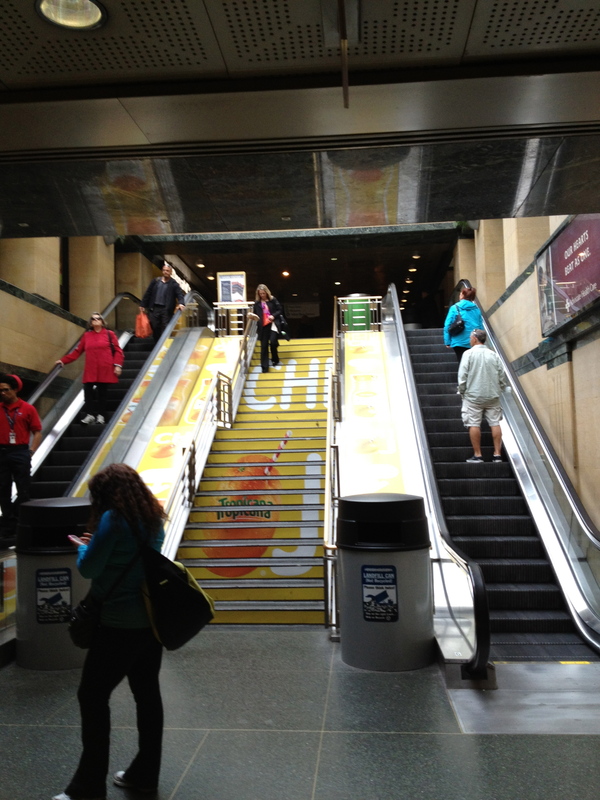 The ads on the steps. And wrapped around a pole. And on the floor. And it all just feels like way, way too much. I know, the brand development person in me should feel differently. But this is one of those moments we have to step out of our own skin as advertising people and marketers and realize that shoving our product down the consumer’s throat within every 5 steps, up, down and all around is the reason why people can get annoyed by advertising, if not hate the hell out of it. Of course we in the industry think it’s great because it’s our copy, our design, our brand and oh, isn’t it beautiful the way that yellow pops just how the way we thought it would in that meeting back at the agency when we saw it mocked up on boards? Isn’t it glorious how big it all is and how it’s everywhere the eye can see? 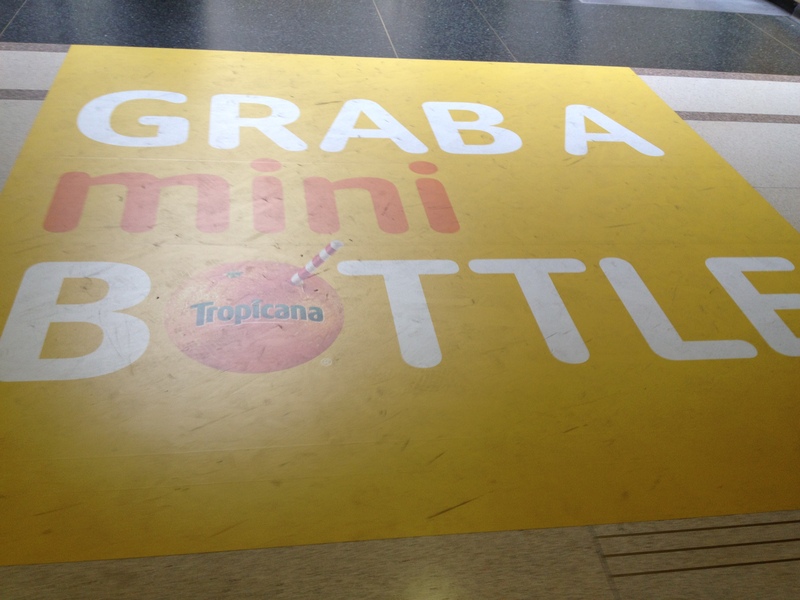 Rather than buying up every available piece of ad space in a concentrated area to get their point across, what if Tropicana had taken all that money they invested and used some of it to give away free samples to those very same commuters on their way to work instead? Put the product right in their hands if you’re going to spend that kind of money. They’re picked up by the pleasant surprise of having some extra Tropicana sunshine in their morning. They smile. They say thank you. They talk about it to others on their way to work – “Hey, where’d you get that Tropicana?” It’s instant gratification of the brand. Isn’t that what we want, really? People to feel good about our brand and tell others? With that sweet and unexpected taste of Tropicana goodness, isn’t it conceivable that they’ll return for another bottle tomorrow? I guess I’ll just look down at the floor. They couldn’t possibly put it there too…never mind, they did. Sure, perhaps overloading them with ads just short of tattooing an orange on each person’s forehead would achieve the same result. But I like my chances better with my approach. This isn’t against traditional ads either or even the creativity of the ads themselves. Far from it. My point is this – if an ad is great and gets people talking, do those people need to be overloaded with its presence to the point of potential turnoff? Who cares if it shares space with other ads if it’s so much better? Even the most gigantic ad possible can be OK because it’s not everywhere. In a city like ours, with some of the most unique architecture in the world, there’s a balance that we have to maintain between advertising product and infringing on the beauty of what makes a structure great. We can be tasteful and achieve our goals in the same breath. It’s times like these that we have to remember we’re the town of Leo Burnett and Daniel Burnham – if our work would make both of them happy, we’re doing right by their legacies. We’re in the branding business. Not the architecture wallpaper business. 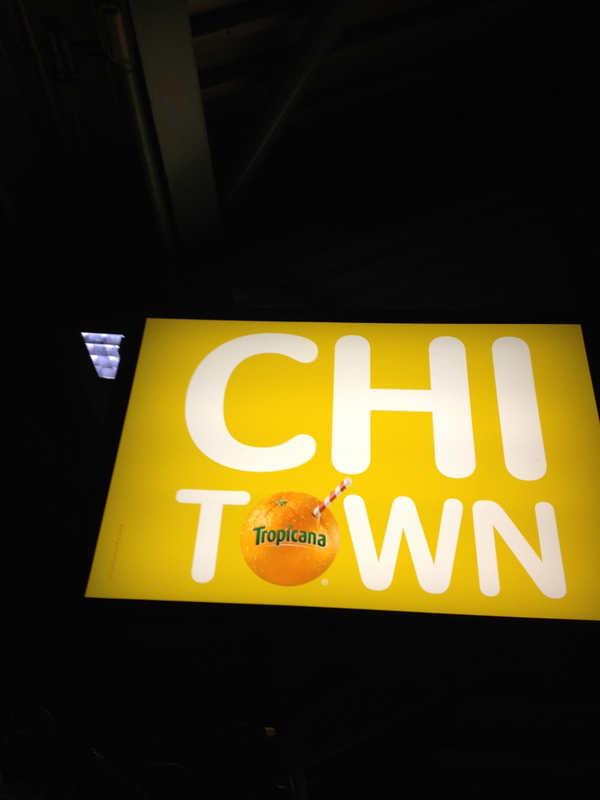 A well-done shout-out to Chi-Town. Maybe they didn’t need much else. With some well-placed signs that hit commuters once they exit the train into the station, how much more do we need? Apparently, a gigantic amount more. That feels a little too perky in the morning. Posted in Brand Critique, You Put That Ad Where? I wonder if weary travelers delayed at O’Hare during this record snowstorm will want to put their fist through one of these ads in frustration, but I’ve got to hand it to Clear Channel Outdoor and Mirrus for an unusual innovation: Airport Bathroom Advertising. Coming soon to your favorite public restroom. It’s actually a cool concept if you don’t feel violated. On your way in or out of the airport restroom, you stop in front of a mirror to check yourself. When you stand directly in front of the mirror, it works like, well, a mirror. But when you’re not standing in front of it, presto! An ad will appear. I’m sure some will be annoyed by the whole thing in the beginning of this rollout. I expect to hear, “Do we really need ads in here too?” Admittedly, we probably don’t. But truth be told, advertisers have been trying to invade restrooms in creative ways long before this. This method does it rather stylishly and as long as it works quickly rather than becoming a distraction by staying on the ad a second too long, I’m all for it. I also kind of see it as the Billboard 2.0: More environmentally friendly and you don’t have capture the attention of someone going 65mph. Taking it one step further and crafting a message around where the ad is placed (bathroom, the airport) would help it stay in a few more brains too. From the sound of this article, O’Hare might be just the beginning of this test concept. What do you think? Invasion of privacy or cool way to reach out to people? Posted in You Put That Ad Where?